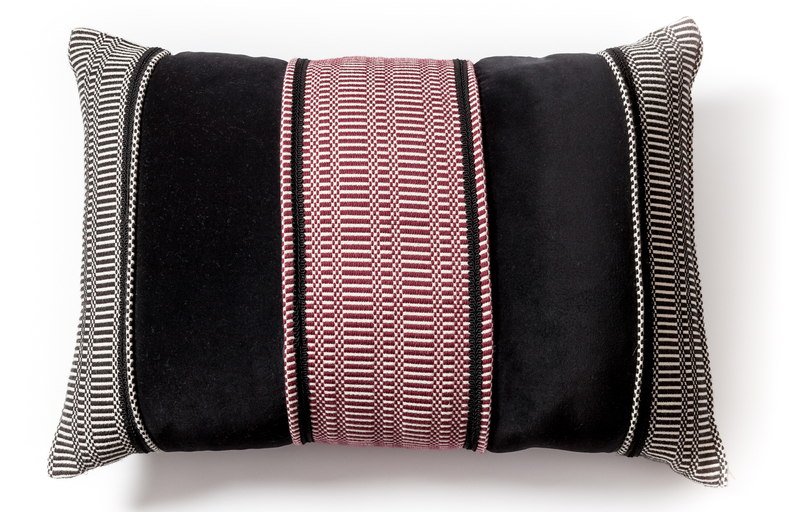 This cushion is woven on a heddle loom like traditional saddlebags, featuring wide loom-woven bands, alternating with black velvet bands and trimmings. 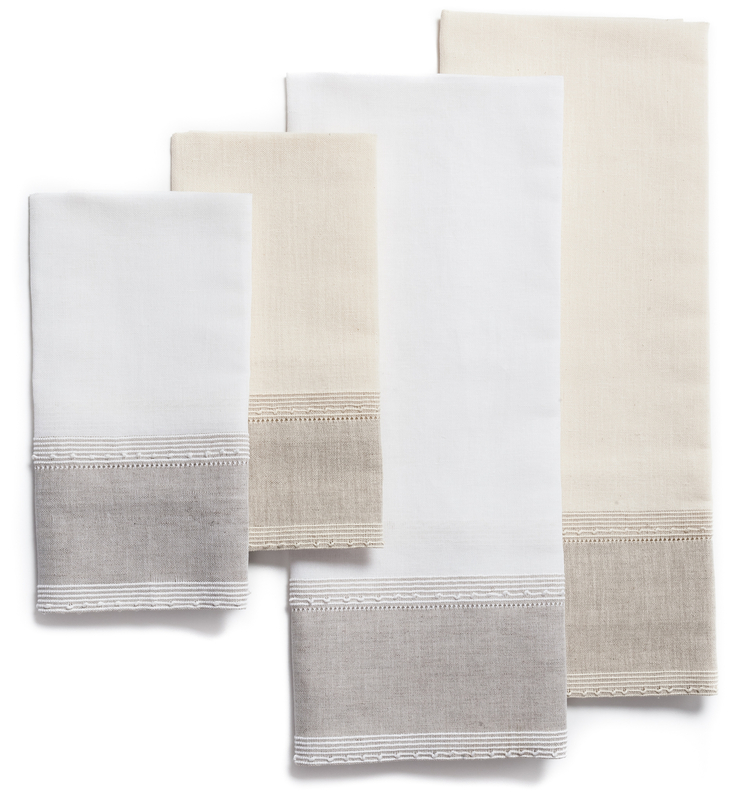 This set of cotton and linen towels is crafted with minimal weaving in different shades. The side decorations are obtained by alternating woofs of different size and colour. 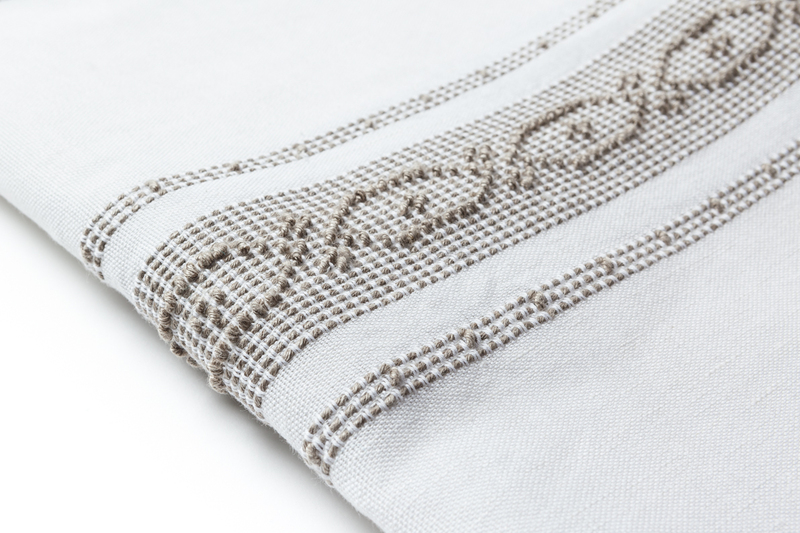 This table runner woven with cotton warps and linen woofs on a handloom, is characterized by the use of the a pibiones technique, featuring two side bands, decorated with the a catenella motif, typical of Sardinian weaving tradition, and a hemstitch. The elegant decoration of this woollen carpet reproduces a design of the local tradition, the lily, realised in a harmonious mirror-effect composition with contrasting shades in blue, lilac and orange on a neutral background. 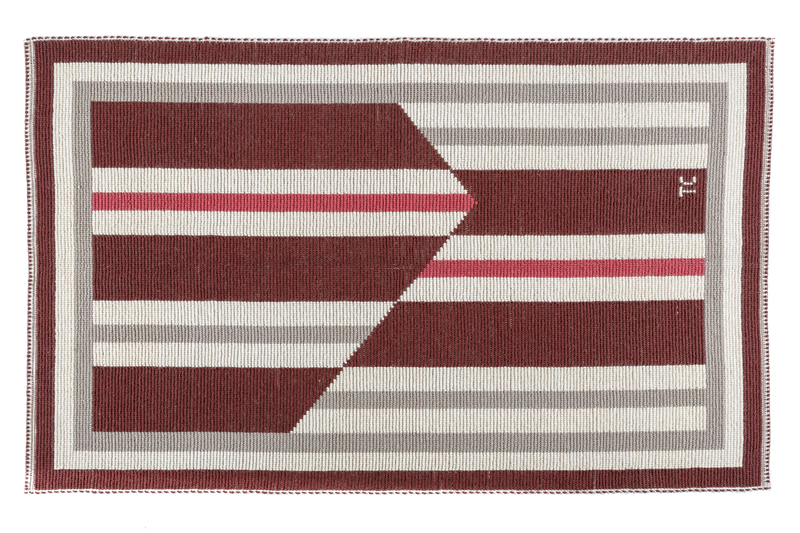 This elegant carpet in Sardinian wool with geometric decoration is characterised by its minimalist taste and composition of large irregular bands arranged in alternating colours in the tones of brown, natural grey and intense pink on a neutral background. Tessart Cogoni stems from a long-time family experience in textile arts. The refined fabrics are made, as usual, by the skilled hands of weavers, working on flat handlooms, in accordance with the local traditional technique, but also with the introduction of innovative solutions. In addition to the products made according to tradition, she develops an important and exclusive line of furniture designed in collaboration with designers and architects. For decades, Tessart has displayed its products in the main national market trade fairs, in Milan, Rome and Florence. At the Villamassargia workshop and the showroom of Villasimius, its fabrics may be admired to appreciate their details and quality. Products include functional and decorative fabrics for home textiles and settings in general: carpets, tapestries, curtains, tablecloths, sheets. The decorative motifs are inspired by traditional patterns. Geometric forms, floral and plant motifs and complex themes, heraldic and allegorical symbols, religious and magical marks. Even the colours are inspired by tradition, by the natural colours of local landscape. All products are manufactured with handlooms, applying ancient techniques, such as a pibiones and a litzus, typical of the village of Villamassargia. The threads used are natural only, including wool, linen and cotton, resulting in top quality fabrics.